This website is created, designed, and maintained by Lana Ululani Robbins © 2005 – 2018 All Rights Reserved. I am a licensed real estate broker in Florida and a licensed managing broker in Washington (which are equivalent) and I have never seen such blatant disrespect by the Overlords pushing the Native Hawaiian Roll onto the Hawaiian people. 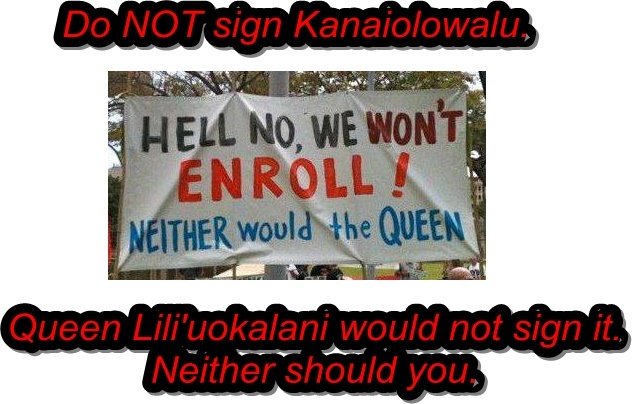 Obviously the Native Hawaiian Roll Commission still does NOT have MAJORITY of consent of Hawaiians so they RUDELY impose, harass, and nag us to “sign.” They are MAHA’OI. ©2005 – 2018 The Hawaiian Foundation and Lana Ululani Robbins. All Rights Reserved. "Strive to be PONO. Don't strive to be popular." Why Did Colleen Hanabusa Clap for President Donald Trump? Did You Know that the New GOP Tax Plan Will Help Hawaiians in Hawai’i?